i b i k e l o n d o n: An invitation to Boris Johnson; " Elephant and Castle is perfectly maneagable by bike"
An invitation to Boris Johnson; " Elephant and Castle is perfectly maneagable by bike"
Yesterday saw a low point in the debate around keeping cyclists safe in London. After months of sustained campaigning around the issue of junction and street design by blogs like this one, local residents, concerned cyclists and the London Cycling Campaign, yesterday's Mayor's Question Time was shocking to say the least. "Elephant & Castle ..is fine. If you keep your wits about you, Elephant & Castle is perfectly negotiable. " To be clear, there have been 89 cycling casualties on the Elephant roundabout in the last two years. It is a major barier to walking and cycling and there have been numerous warnings about how dangerous the junction it is. It is the the "most dangerous" on our list of the 10 most dangerous junctions for cyclists in London. Transport for London recently rejected a proposal to turn the roundabout in to a pedestrian peninsula because it would slow down traffic too much. "It realy worries me when I read about cycling accidents. And it grieves me sometimes to see the way that TfL are blamed. ", said Johnson. Did you get that? Boris Johnson grieves when Transport for London are in the firing line; this is the authority who ignored a 2008 report at King's Cross which claimed the junction made traffic "very agressive" at this location and that "casualties were inevitable". Min Joo Lee, a 24 year old cyclist died here last month. TfL have still done nothing to make this terrifying junction safer. Over at Bow roundabout where Brian Dorling was killed by a tipper truck last month, London Assembly member John Biggs has been pushing for years to slow the junction down and make it safer by introducing pedestrian crossings (of which there are none at the moment, incidentally) He was rebuked by TfL because the solution would "slow down traffic too much". Concerns raised by the London Cycling Campaign about the inherent danger of Bow roundabout when CS2 was being planned have been ignored. The London Cycling Campaign explains of other examples; "Cyclist fatalities in Camden and Clapham (Paula Jurek and Johannah Bailey respectively) were also preceded by warnings that the junctions where the crashes took place were dangerous to vulnerable road users"
Their CEO, Dr Asho Sinha elaborates: "“Does the Mayor really not believe in redesigning bad junctions? “If that’s the case, why commission recent junction improvements at Piccadilly, New Cross Gate [Kender Street], Mansion House, Elephant & Castle [southern roundabout] and Whitechapel [Cambridge Heath]? None of these works were done to speed traffic flow; quite the opposite, returning one-way streets to two-way and taking out roundabouts are measures we welcome to reduce speeds and increase safety for cyclists and pedestrians - part of the long journey towards creating a more liveable London. This asks the serious question as to why the Mayor thinks it is a good idea to improve junctions at some places, but not at London’s 10 most dangerous locations? I'm angry, and I know a lot of you are too. Time and again readers have been contacting me to ask how and why Boris just doesn't "get it", and why he doesn't believe that designing safe and sensible street junctions can only be a good thing. Sadly, I just don't understand his logic either. So I lay down an open invitation to Mayor Johnson; Boris, join us for our ride of your transport authority's 10 Most Dangerous Junctions for Cyclists this Saturday and come and see for yourself just why these urban spaces don't work and just why they need to be urgently reviewed. There may be many 100s of us on the ride, Mayor Johnson, and not all of them will be happy with you, but I think it would be so valuable for you to hear - straight from the horse's mouth - exactly why they are expecting you, as our cycling Mayor, to do better, and to share their everyday and first hand experiences of these awful urban spaces with you themselves. I hope you can make it. The "Tour du Danger" of TfL's 10 Most Dangerous Junctions for Bicycles takes place on Saturday (Nov 12th) at 10.30AM from St Mark's Church, The Oval. Be there, spread the word and bring your friends! Click here for a copy of the route. Couple of points. One pootling, the other more important. Pootling first. Significant difference between transitive and intransitive verbs 'to grieve'. Boris doesn't grieve for TfL. He his grieved by the way TfL has been blamed for crashes involving cyclists. Not helpful to misrepresent him in an otherwise good piece of comment. More important. The most dangerous roads (or junctions) are not necessarily those with the highest absolute casualty figures. The The Netherlands sees 60 per cent more cyclists killed on its roads than the UK, even though it's a much smaller country. But the Netherlands is safer for cyclists. It has a lower casualty rate - numbers killed per km cycled, or per journey, whatever your measure of choice. Likewise, there are junctions in London that are more dangerous but have fewer casualties than the ten you've picked. This is because few cyclists dare ride on them. At the very least your top 10 list should be normalised for cycle traffic, i.e. the junctions with the highest rate of cyclist casualties per cyclist who rides through the junction. I realise the stats may not be sufficient to do this. And I know it makes sense from a media point of view to talk about the 'top ten danger blackspots', but it really plays into the hands of those who say that their top priority is to reduce the number of cyclists killed on British or London streets. Personally, I would like to see the number of cycling deaths in the UK rise to the levels of the Netherlands. This would almost certainly be what would happen if we ever manage to increase cycling to Dutch levels. Well worth reading Bob Davis's Death on the Streets about this. See you on the ride on Saturday, and keep up the outstanding campaigning work, TV star. Thanks Jack for your comments, and indeed your support. Looking forward to catching up on Saturday. You're right about the verb to grieve, of course, though why he should be upset when TfL are criticised for their lack of action at known dangerous junctions is just as scandalous, of course. You're quite right, too, about the most dangerous junctions - you'll note that Parliament Square and Old Street aren't on there most probably because cyclists avoid them at all costs. The problem with lots of the blackspots is that even for drivers they're pretty hard to negotiate. Too many lane changes required to get where you want, several lanes of traffic to manage simultaneously. I've ridden around E&C once and will never do it again because it goes from stressful in a car to lunacy on a bike in rush hour. @Anonymous I agree completely! I don't think these spaces work for people who need to drive, or for people on buses and public transport and they're lethal for people on bikes and by foot. We really need these spaces to be improved. Boris's meaning is perfectly clear: he doesn't think TfL is responsible for providing a safe cycle network. What grieves him is that TfL are being blamed (unjustly in his eyes) for their failure to do just this. All good points by Jack at the top. However, there's another comparison to be made. The most dangerous junction in the whole of the Netherlands has resulted in 14 injury incidents in three years. This isn't 14 incidents involving cyclists, but of all modes. That's for a junction on a road with over 14000 cyclists per day as many people on foot and by car. This is a far cry from Elephant and Castle injuring 89 cyclists (are there figures for other road users here too ?) in two years. However, this is as bad as it gets. It is considered to be be a problem and it's going to be changed. I've a blog post lined up about it tomorrow. Elephant and Castle is a dangerous spot for cyclists. Its not so much the lanes but the speed of which the cars a travelling. You just have to concentrate the whole time and don't always believe you have right of way even if you do by the law. Cars, trucks and buses are big and heavy and if they don't stop they kill you. The thing that gets me about cycling in London is the lack of common sense showed by cyclist to there surroundings. I know this is a generalisation but the amount of cyclists taking risks when they don't need to is unbelievable. I know cycling gets the adrenaline up so naturally more aggression comes up in the riding style, but these are public spaces and have to be shared by everyone. That means yes, as cyclist we should wait at green men, not run up the insides of trucks if there is a possibility they could be turning left (even if they are not indicating) and maybe its not a good idea to have music in your ears while cycling. I know other members of the public do stupid things, but unfortunately we can't change that, we can only be aware that these things might happen and we can't always blame somebody else. An example is once I was getting off the bus near tottenham court road. The bus stop near the crown pub which is a bus lane and cycling lane only. The bus had stopped at a funny angle but we were at the bus stop. The driver opened the door and I proceeded to get out. At that moment a gentleman on a Brompton (spelling?) hit is brakes stopped and proceeded to shout at me for not looking where I was going. At this point I explained to him that this was a bus stop and I shouldn't have to look while getting off the bus. Imagine if a mother and pram were getting off first and he had collected them. This is what I mean about paying attention while cycling. Cyclists don't always have right of way. 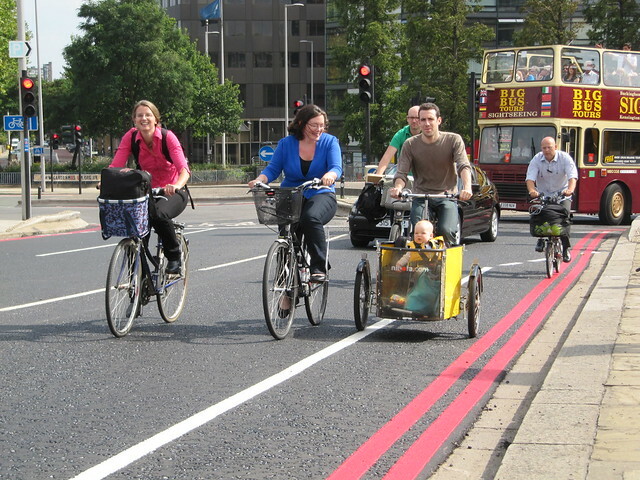 It will be impossible to change london into a completely cycle safe city simply because there is no room, but if everyone using the roads shows more common sense and courtesy to one another I think it would be made safer for everyone. Don't get me wrong I'd love to see more cycle lanes etc, but realistically this won't be happening in a rush. This site is very helpfull in tour world.I think it will reflact as like as sun shine. Golden triangle india is same as like this site. It called every one for visite very atractive place of India.